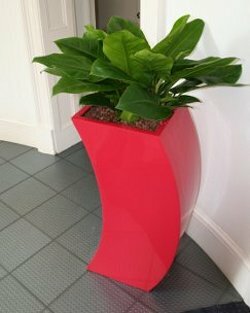 These stylish curvy planters are hand made from tough fibreglass and are available in two sizes. Colours on offer are any BS4800 or RAL in gloss, matt, metallic or ornate. Can be used inside or outside, although if being used outside we would recommend that the planter have drainage holes drilled in the bottom.